Translucent Exhibit: Works by regional award-winning photographers Karen Bell and Ennid Berger. A New York City and East End resident, Karen Bell explores natural curiosities such as feathers, reeds, and twisted vines while exploring through woods and then prints her findings of combined photographic images on airy layers of vellum over paper. Her creations represent the normal densities one observes daily, focusing on a single layer as we try to take in an entire translucent dimensional scene. Along with her vellum constructions, Karen is also exhibiting delicate images from chance encounters found with greenery fragments and petals afloat in still waters. Based on Long Island, Ennid Berger is exhibiting luminous images that have captured the energy and mass of her botanical subjects on light sensitive paper. Creating through the alternative photographic process of the photogram - historically scientific in nature then rediscovered artistically later by artists including Man Ray and Lazlo Moholy-Nagy - each of her images is one of a kind and created without a camera in a traditional darkroom using multiple printing processes. Further enhancements of some of her pieces include hand-applied oil paint. All works in this exhibit are Limited Editions. To purchase works from this exhibit, please contact the Gallery 631-734-8545. The “Translucent” Exhibit and Gallery Talk are sponsored by Abatelli Realty of Cutchogue. 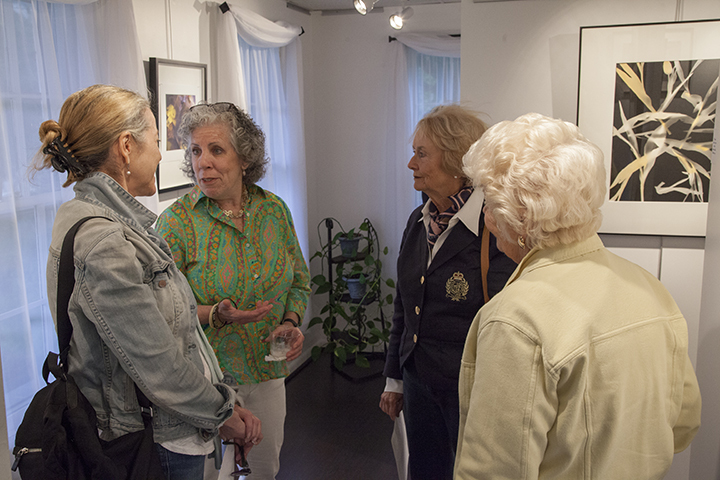 The “Translucent” Exhibit opening reception with wine sponsored by Lenz Wines was on Saturday, June 27, 2015. We thank Steven Schreiber for the following photos.